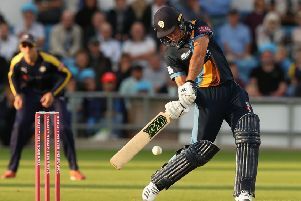 Derbyshire Falcons captain Gary Wilson said he side “couldn’t live with the pressure” put on to them by the Worcestershire Rapids bowlers in Thursday night’s Vitality Blast defeat. Rapids posted 137-8 from their 20 overs largely thanks to an innings of 76 from Joe Clarke and bowled well to restrict the Falcons’ chase as the visitors closed on 121-7. Wilson said: “It is hard to explain. It was a very good bowling performance by us. “Okay, it was a slowish wicket but we should be knocking off 137 nine times out of 10. “At half-time, although we didn’t think the game was over, we felt we were well on top. There was no complacency. We just haven’t played well enough to win the game. “They obviously bowled well. We’ve done a lot of things there we said we didn’t want to do and we need to learn not just for the end of this season, but next season as well. “That is not how we want to play our cricket. There are two ways about going about chasing a smallish total. You go out and bang the ball and try and finish it in 15 overs or you play normally.